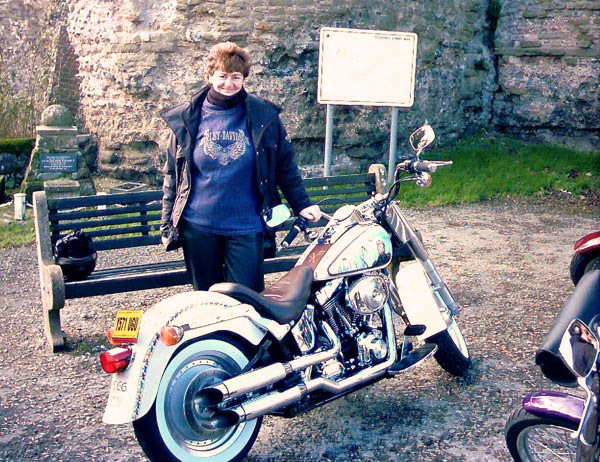 The bike is a 2001 Harley Fatboy. 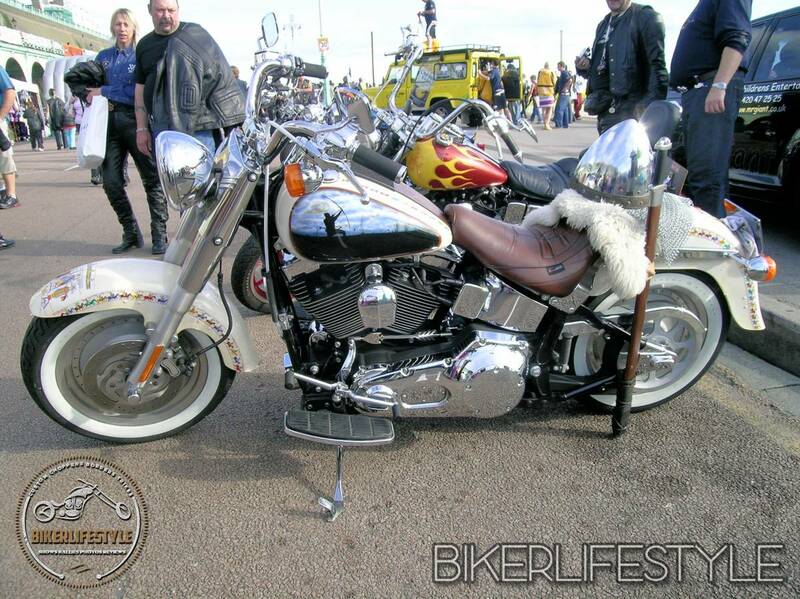 Its’ the 4th Harley that I have had and the 2nd Fatboy. 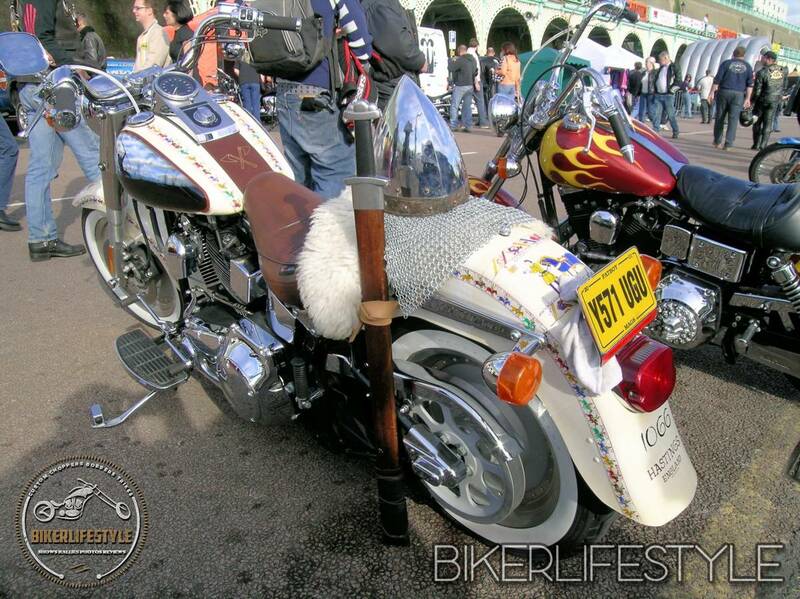 I love the Fatboy to me it is the quintessential Harley and a design icon. I love it’s big chunky look. I sold my Evo Fatboy before I bought this one as it’s a Twin Cam. I really miss the Evo in a lot of ways – I sold it because I tried to give up biking as my husband is not keen. Trouble is is that I really love the bike and going everywhere on it but this does mean that my husband gets left behind a lot especially at weekends in the Summer. He likes Harleys and he is quite proud of me and stuff but he does not want to join in with me and my mates or ride a bike or go on one at all. This has been going on between us now for twenty years or so and so is unlikely to change. He has to put up with it! 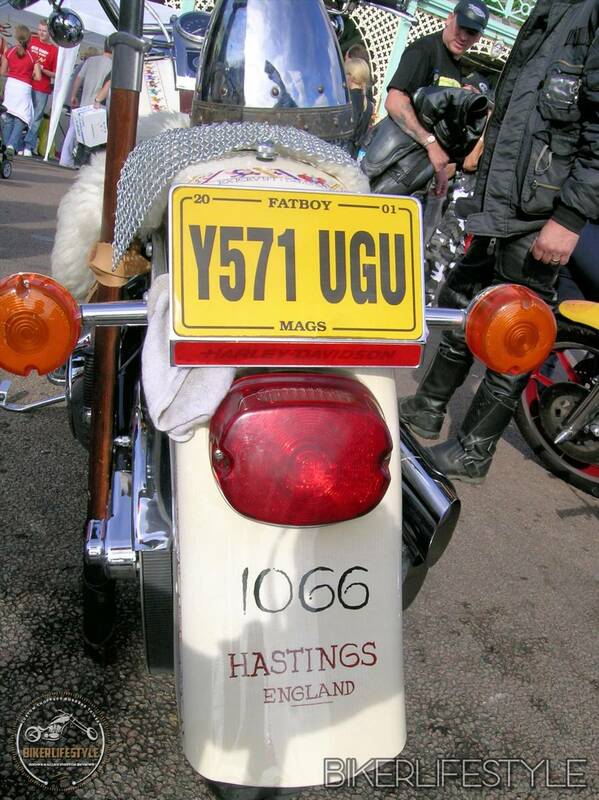 Anyway when I got the 2001 Twin Cam I thought I would make it unique to me and to Hastings in East Sussex where I live. 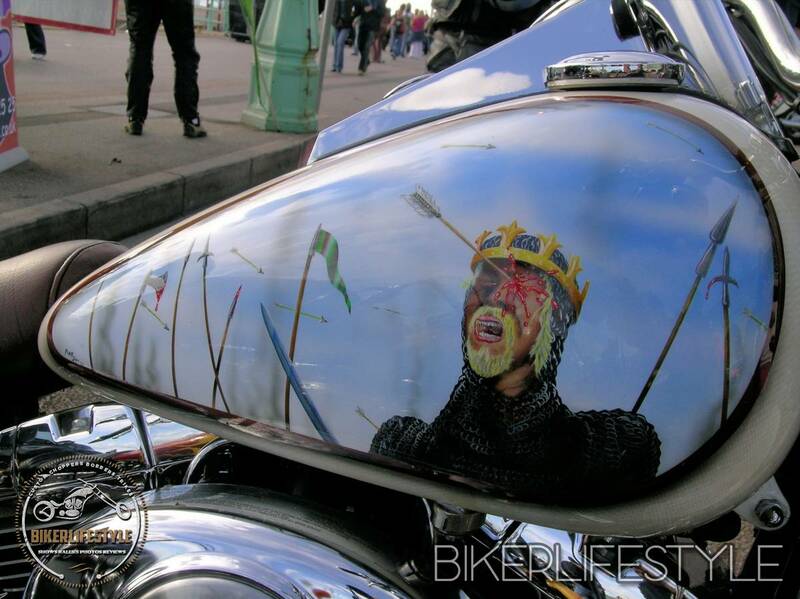 I am very interested in the Battle of Hastings in 1066 and decided to customize my bike to commemorate the 1066 Battle. Steve Mohacsy of Pure Art did the paint job and it was very difficult to design. 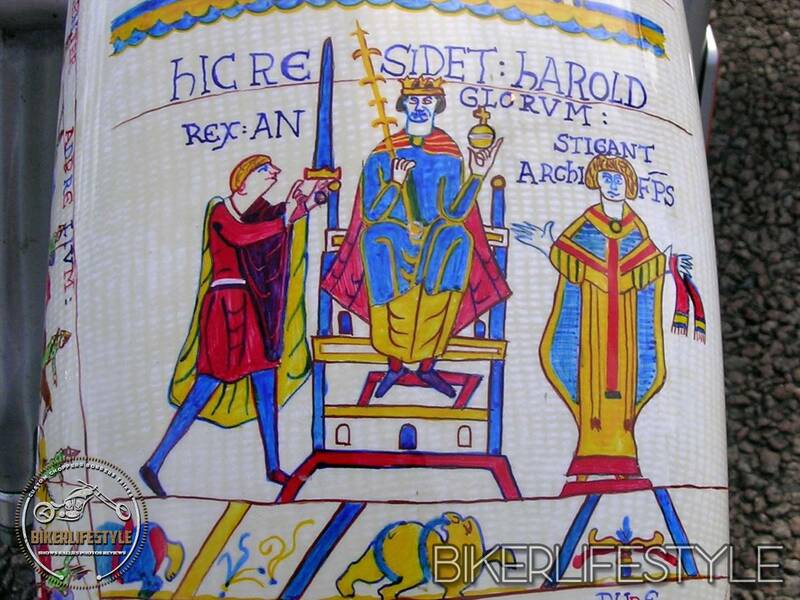 Steve helped a lot with the design – I wanted him to use images from the Bayeux Tapestry (the only contemporary record of 1066) and also to paint two murals on the tank – the right side showing King Harold with the arrow in his eye and the left side the Norman archer. It was difficult to tie in the tank with the other images but I think Steve did a fantastic job. 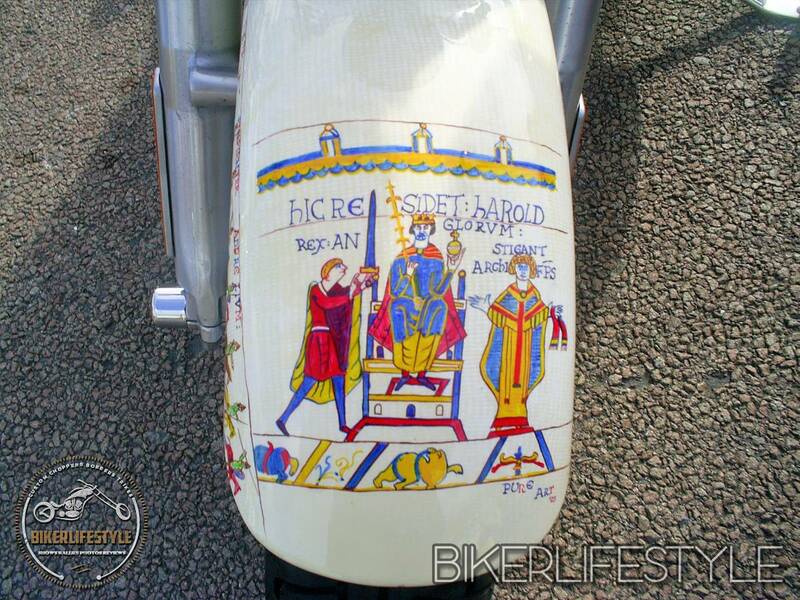 The fender sides have got the English and Norman armies marching to battle with the latin inscription describing the events. The background of the bike is a really clever finish that looks like fabric. 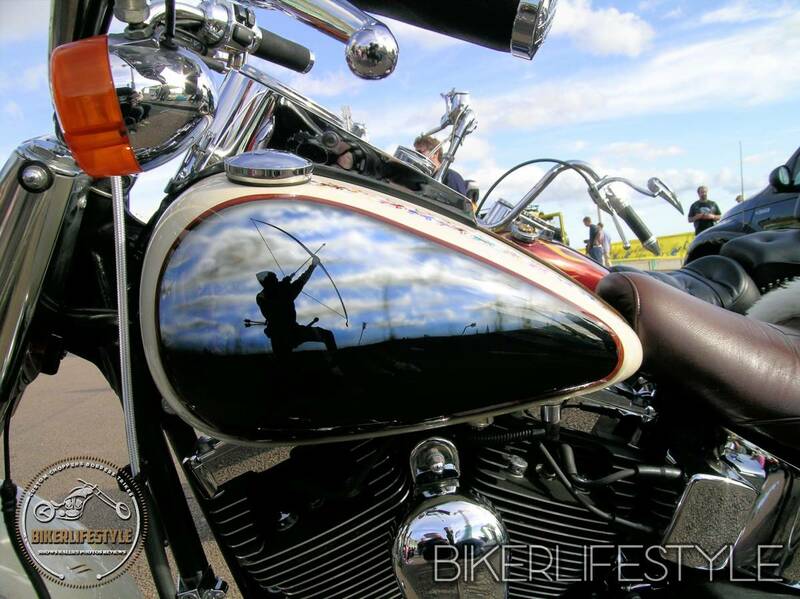 Much of the detailed work is hand done – only the tank murals and background are airbrushed. I think it’s a wonderful paint job by an obviously talented artist. I’ve tried to find bits and pieces to add to the bike that match the theme but I haven’t made any major changes to anything. I’d like to put some different pipes on it this year and am trying to get a bespoke pair made with arrow ends which would look cool. Marty at SmartRRRs made the custom seat which has a conical helmet stitched into it. I have ridden this bike all over Europe and it is amazing that everywhere I go it is instantly recognized and people know what 1066 was.